Home Who are we? 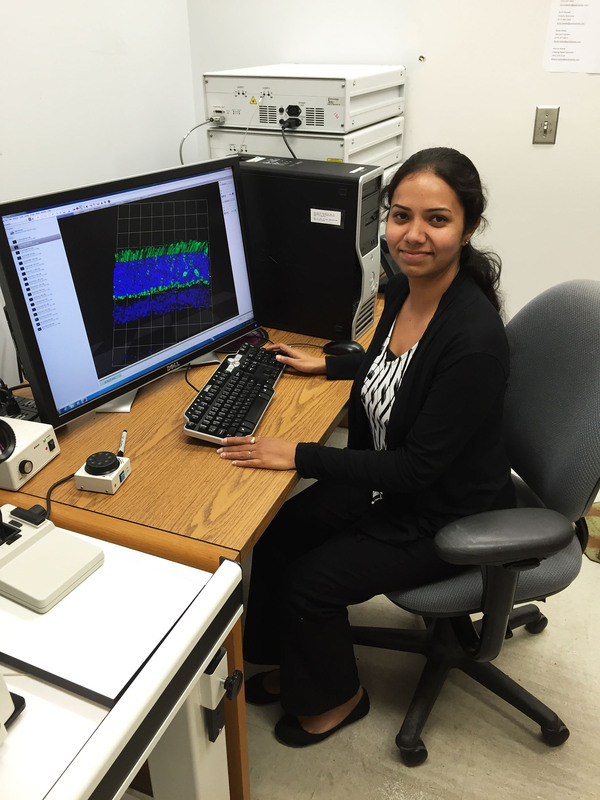 Postdoctoral Associates Shreyasi Choudhury, Ph.D.
Shreyasi received her PhD in Biomedical Sciences from the University of North Texas Health Science Center, Texas in 2014. Her research was focused on studying the role of caspase-7 in retinal neuronal cell apoptosis, especially in photoreceptor and retinal ganglion cell death. By studying the two different disease models, T17M RHO Autosomal Dominant Retinitis Pigmentosa (ADRP) model and Optic Nerve Crush (ONC) model she found that caspase-7 plays a critical role in photoreceptor and RGC death and inhibition of caspase-­7 activity may be a novel therapeutic strategy for treating retinal degenerative diseases. Besides studying the molecular mechanisms that underlie retinal degenerative diseases she is also interested in developing gene therapy for treatment of retinal diseases, which brought her to the University of Florida since it is home to some of the world’s leading researchers in gene therapy. Her current research is focused on developing safer gene delivery to rod and cone photoreceptors in fragile, diseased retinas that are prone to surgery induced retinal detachment. She is actively involved in developing novel AAV vectors capable of transducing photoreceptors following a safer, less invasive intravitreal injection. She is also working on the optimization of the AAV capsids to confer better adhesion to the inner limiting membrane and traffic to the outer retina while maintaining or gaining photoreceptor tropism. Sanford L. Boye, James J. Peterson, Shreyasi Choudhury, Seok Hong Min, Qing Ruan, K.Tyler McCullough, Zhonghong Zhang, Elena V. Olshevskaya, Igor V Peshenko, William W.Hauswirth, Xi-Qin Ding, Alexander M. Dizhoor, Shannon E. Boye “Gene therapy restores useful vision to a model of the GUCY2D-LCA1 patient fovea, the all-cone Nrl-/-Gucy2e-/-mouse”. Human Gene Therapy. August 6, 2015. doi:10.1089/hum.2015.053. Yogesh Bhootada, Shreyasi Choudhury, Clark Gull, Marina Gorbatyuk. “Targeting caspase-12 to preserve vision in mice with inherited retinal degeneration.” Invest Ophthalmol Vis Sci. 2015 Jul 1;56(8):4725-33. doi: 10.1167/iovs.15-16924. Choudhury S, Bhootada Y, Gorbatyuk MS. “Caspase-7 Ablation Modulates UPR, Reprograms TRAF2-JNK Apoptosis and Protects T17M Rhodopsin Mice from Severe Retinal Degeneration”. Cell Death Dis. 2013 Mar 7;4:e528. doi: 10.1038/cddis.2013.34. Shreyasi Choudhury, Sonali Nashine, Yogesh Bhootada, Mansi Kunte, Oleg Gorbatyuk, Alfred S. Lewin, Marina Gorbatyuk. “Modulation of the rate of retinal degeneration in T17M RHO mice by reprogramming the Unfolded Protein Response”. Adv Exp Med Biol. 2014;801:455-62. doi: 10.1007/978-1-4614-3209-8-58. Kunte MM, Choudhury S, Manheim JF, Shinde VM, Miura M, Chiodo VA, Hauswirth WW, Gorbatyuk OS, Gorbatyuk MS. “ER Stress Is Involved in T17M Rhodopsin-Induced Retinal Degeneration” Invest Ophthalmol Vis Sci. 2012 Jun 20;53(7):3792-800. doi: 10.1167/iovs.11-9235. “Role of ER Stress-Induced Caspase7 in Retinal Degeneration of T17M Rhodopsin Transgenic Mice” May, 2012, ARVO, Fort Lauderdale, Florida – Poster presentation. “Role of ER Stress-Induced Caspase7 in Retinal Degeneration of T17M Rhodopsin Transgenic Mice” April, 2012 RAD, UNTHSC, Fort Worth, Texas – Poster presentation. “Anticonvulsant Effect of Tantu Pashan on Maximal Electroshock seizures (MES) in Mice”, April, 2008, Indian Institute of Chemical Technology, Hyderabad, India – Poster presentation. “Anticonvulsant effect of Tantu Pashan on Pentylenetetrazole (PTZ) induced seizures in Mice”, May, 2007, Indian Institute of Chemical Technology, Hyderabad, India – Poster presentation. “Study of Anti-anxiety activity of aqueous extract of fruits of Emblica Officinalis in Rats”, April, 2007 NIPER, Mohali, India – Poster presentation. “Study of Anxiolytic effect of Ethanolic extracts of leaves of Ocimum Sanctum in Rats”, April, 2006, NIPER, Mohali, India – Poster presentation. Retina Research Foundation/ Joseph M. and Eula C. Lawrence Travel Grant award-The Association for Research in Vision and Ophthalmology (ARVO), 2014.